Turning a 41 year old truck into a 4×4 is one hell of a project. So a bit of back history for any who wish to follow this thread in progress…. My dad has been a professional automotive technician from before I was born, He is a very gifted man, and a bit of a savant with working on cars. Growing up, he often talked about wanting to get a truck. when i was about 13 he did some work in trade for a 73 Ford F-100 that had a blown 302 in it. I helped dad build the truck, and we put quite a bit of work into it. It started life from ford as a half-ton two wheel drive pickup with a blown engine and a four speed transmission. Dad decided to put a 460 engine in with a C6 automatic transmission. In the process we had to do alot of converting of things, including a custom drive shaft, new perches and mounts, and swapping out the suspension for 3/4 ton springs, with overloads on the rear. I don’t really remember how long we worked on various parts of it, but eventually it was finished and up and running. We used it to haul everything, once I had my license, i got to use it frequently, and quite enjoyed the truck i had help in small ways to create. For years I always told my dad if he ever wanted to get rid of it, that id love to buy it. Fast forward several years later, Dad called me up one day and asked if i still wanted it, Yup! What did he want for it? a hug. For years, the truck had a bit of torque to traction issue as the pinion still was the original from the 302, and it was now powered by a 460. We found gears for the pinion to get the gearing back where it should be, and while it was not as easy to spin tires, they would still spin any time you wanted to stomp on the gas. About five years ago, while driving in town (at only 35mph mind you) the engine started a rather loud knocking noise. The engine threw a main bearing. With dad about things, by our best estimate, the engine should have between 250-350,000 miles on it at least. Simply put it was time to rebuild the engine. After letting the truck sit for a few years, I wanted to get the truck resurrected. Like a phoenix rising from the ashes, rising stronger and better than before, I again started to think on how to improve things and build it even better. I was talking to dad, and discussing how that the only draw back the Ford has ever had, was in traction. even after swapping out the gears in the pinion it was still an issue, especially on wet roads or dirt. I asked him how hard he thought it would be to convert things to 4wd. In my dad’s characteristic reply was, “well all it takes is time and money.” In seriousness though, if you want to, we should find a 4wd that’s not running to buy cheap and convert things over. 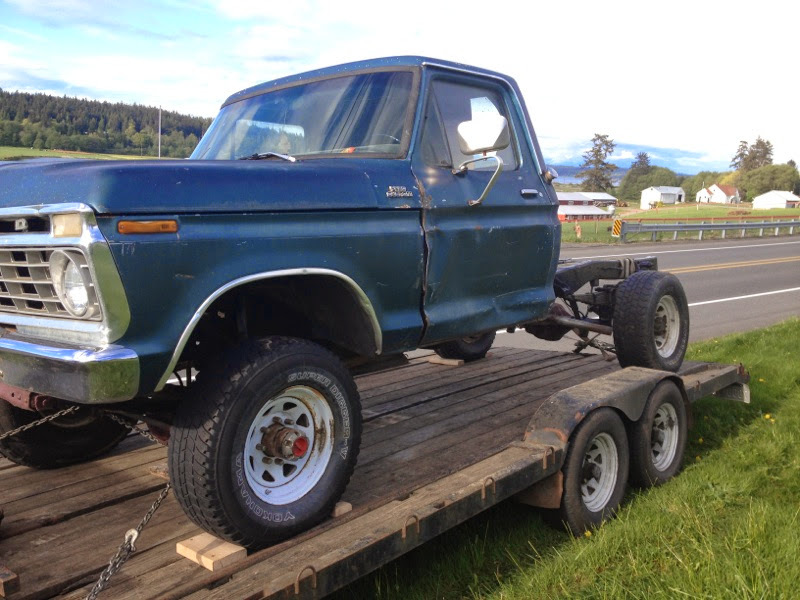 After searching craigslist for a long time, we found a 1973 Ford F-250 “High Boy” without an engine for sale up in Canada. My dad was nice enough to spend the day to go drag it home. The body work is horrid, but really what i wanted was the frame, axles, transfer case, drive shafts etc. (Side note: Dad, thanks again for going to drag it home!) In doing a lot of research on the truck come to find, that these are some of the most sought after ford 4x4s made. 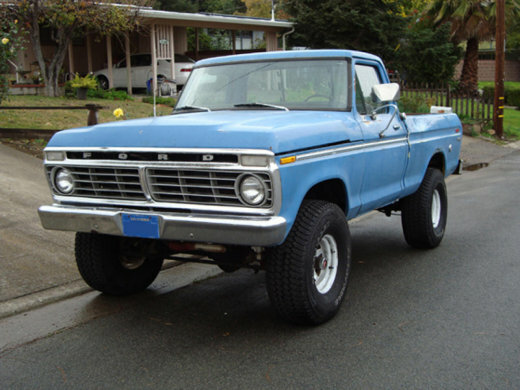 However, Ford in their infinite wisdom decided that putting a low pinion front axle and four wheel drum breaks on the truck was a grand idea, that they didn’t get around to addressing until the 1977 1/2 and up model year. This truck also did not have power steering… So low pinion, drum brakes, and no power steering? Me thinks thats three strikes against the front axle. It must be replaced! So after deciding that the front axle needed to be replaced, the internet searches began. 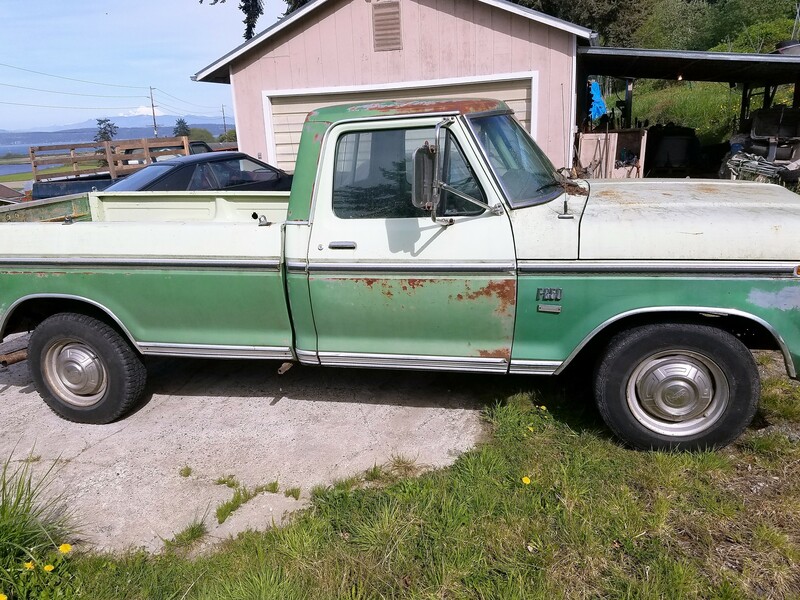 Looking online i found axles running anywhere from about 600-1500.00 plus shipping (which would cost again as much as an axle) So I started surfing Craigslist, and found an ad for both a front/rear axle being sold for only 400.00 up in Washington. (close enough that dad could pick up!) After about a week of discussions with the seller, we ended up buying the entire truck. It is an ugly mess, however it has the front axle and power steering linkage we needed, as well as a bunch of parts we can sell. 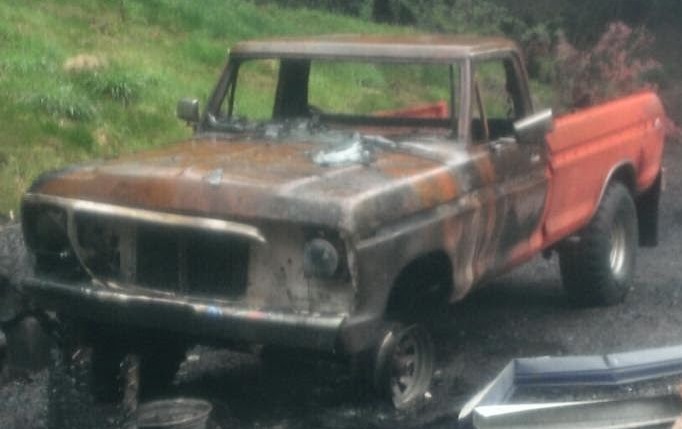 The truck was involved in a house fire, that torched the front half of the truck, however you really cant hurt cast iron that way, and its a 78 F250 and had power steering. So axle found! The bed will likely also be used, as I plan to relocate the fuel tank from the cab to under the bed. None of the trucks had very straight body panels on them. Dad found a truck that has a straight body and only minor rust issues. Its a 73 Camper Special. It also has AC, a rear hitch and dual tanks which will make setting up those things easier for my truck as well. When my truck is done, it will likely be quite close to this one, minus that ugly dent in the bed. Mine will have a 460, with a C6 Transmission, with Clutch kit, a divorced transfer case, a high pinion 78 front axle with disk brakes, with power steering, and eventually an air locker setup front and rear. Stay upto date in the blog section as the build progresses. And if you need parts check out the parts for sale! © 2014-2018 The-Tribunal.net All rights reserved.